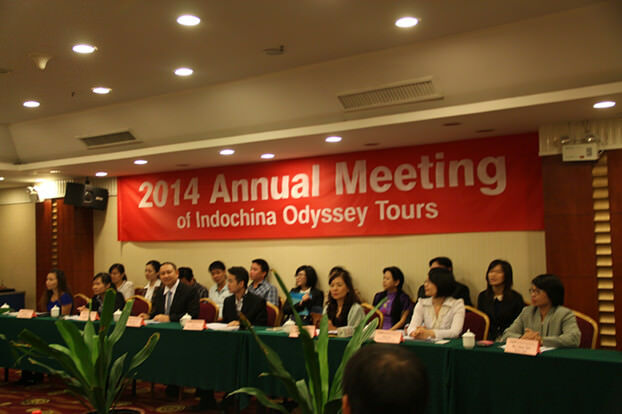 On May 12 and 13, Indochina Odyssey Tours annual meeting with local offices was held successfully in Guilin, China, where the head office of the company locates. Travel experts from Odyssey local offices in Vietnam, Cambodia, Laos, Myanmar and Thailand participated in the meeting and communicate extensively with staff at the head office during the 2-day conference. The meeting started with problem reports, when problems related to customer service and tour operation of each destination in the past year and accordingly improvement measures were reported, discussed and reinforced. Followed is the destination demonstration given by Southeast Asia local offices sharing first-hand destination knowledge, new tour products, and customer’s potential interest.